usually once christmas is over (which i'm pretty sad about this year...i had a great christmas! hope you did too) i'm so ready for a new year it's not funny. the hope that the next year will be better takes me over...especially after a tough year. so naturally, now that christmas is all done, i'm busting to get started on next yr. with this comes how i'm going to try organise myself. usually i just find a diary and calendar and be done with it. however i get half way through the year and abandon both! am i the only person who does this?? 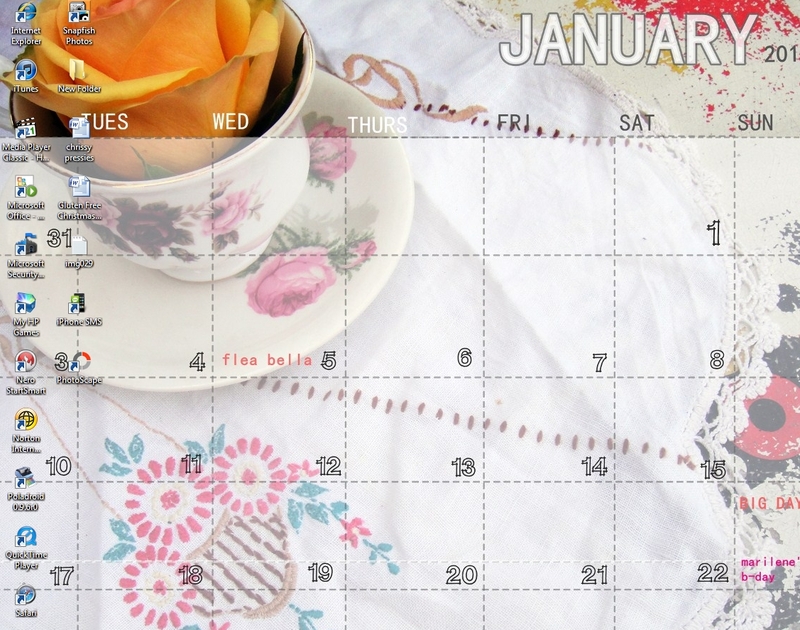 this year i've decided to keep my frankie calendar (you know the one you get for free in the frankie mag?) for the wall but will keep a copy on my desktop. i figure i'm on the computer everyday anyway, why not! and i can't lose it then too : ) i'm also going to buy myself one of kikki-k's 365 books and use it as my diary. so seeing as i will be creating a desktop calendar for myself each month, i figure i may as well pop it up on here too incase you'd like to use it! this is what i have in mind....it may change yet! you then open the file up in your normal photo program and using the text tool write in what you have to do each day. then save as and open it again. right click and click "set as background"
this is a screen shot of mine....it will obviously get fuller as the month goes on. i'm still trying to sort out a few details, so will get it up shortly. are you interested in using this as your desktop wallpaper?? i had a list of blog posts i wanted to do...now i can't find it. typical isn't it! the butterfly effect project = awesome! cookies in a jar.....these are christmas presents, so not saying too much about these yet! and no links either yet sorry! the artist i just saw on the ellen show who did an entire picture out of sequins. just amazing! still trying to find some pictures of it. it was so cool. um, there was something else too, but don't know what they were now. poo it. ah well, these blog posts to come soon! this little puffy africa reminds me of my sister (she lives in durban, SA) as we bought them together while i was over there last year. 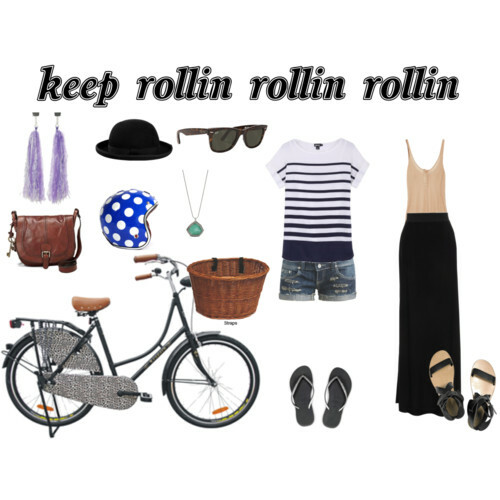 keep rollin rollin rollin is the theme for this week. while others who participated this week have gone down the roller skate, blade, skateboard and ice skating road, the only wheels i've got my eyes on are my brand new bike! so this is the main feature of this set. as i'm a pretty useless bike rider a basket on the front was absolutely necessary as i am unable to ride with a bag on.....even a satchel. i've been busting to get some pretty streamers to hang out the handles (and a set of training wheels!) but my husband keeps telling me it will ruin the look of the bike. he has a point. i would wear a pair of shorts and simple top with my havs for rides to the beach on a hot summers afternoon. or for a jazzed up look a long black skirt with top and sandals. simple......but not so simple to ride a bike in. hmm, perhaps not so practical but i'd be styling! i'd love to say i'm cool enough to just wear no helmet or a bowler hat, but i'm not and as i just mentioned i'm a crap not a confident bike rider. so a helmet is next on my list of things to buy. i love this spotty blue one. a normal bike helmet just wont cut it. and may still have a crack at recreating it, but i've seen a fairy princess one in the kids section of k-mart. so basically a pink skater style helmet....and luckily i have a small head/kids heads are getting much bigger these days! oh i love my bike. go and check out the sets other bloggers have created. Ever have those days when you just want to world to swallow you up.....today is one of those days. actually mainly this afternoon....this morning started out fine. i want to escape it all...i've had enough of everything really. trailer trash was last weeks theme for the polly dolly challenge. i'v done 2 trailer trash looks. a midrif top (pasty white gut hanging out the bottom of the left look), denim shorts (pasty white gut hanging out over the top of the left look) and a pair of lace up shoes. a bra of some sort. the left look has a ridiculous of eye liner present, the right look has slightly less eyeliner. the left look has that stupid hasn't-been-brushed-for-months look that lots of teenage girls are sporting at the moment (oh how old i feel and sound right now!!! ), wish i could take that back but they do look ridiculous. the right has a messy top knot. drink of choice is...for the left a bacardi breezer/udl of some sort, for the right i tried to find a west coast cooler (oh how i love these!) picture but couldnt, so goon it is! ke$ha for the trash look and gaga for the slightly less trashy look. so there's my trailer trash look...inspired by some of the highschool girls that go to the local high school. i fear for society when these girls graduate...if they do. so i didn't get around to doing this yesterday (long story about forgetting to order a decaf coffee after not having any caffeine for months and then not really being able to function all afternoon! )....but as they say better late than never. anyway, that's it for now....off to get to the shops on opening time before the rest of the coast does! i don't enjoy driving around the carpark aimlessly looking for someone to stalk for their park. this is the cake that i tried to have a crack at today. i'd seen it before but was re-reminded by it through creativity and love . 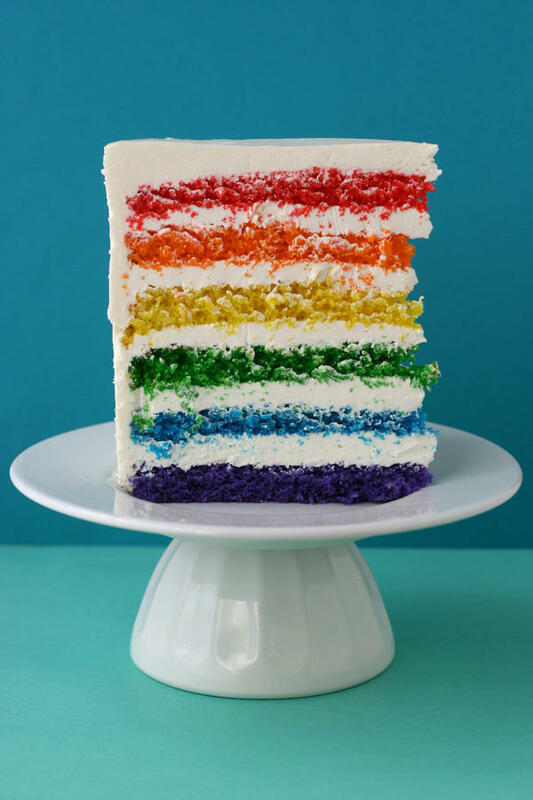 now, when i say "have a crack at"..i don't really mean try the whole layered and iced version. i'm far too lazy for that! i made a basic cupcake mix...using gluten, wheat and dairy free products, then put food colouring in to make the colours. i put the purple batter into the patty pans first. and this was how they turned out, not quite the same. ( i envisioned clear levels of colour). i made yellow vanilla icing...but would leave it white next time. might look slightly less kiddish and scary! so not quite a recreation, but not an epic fail too. they still taste alright....a little eggy compared to normal cupcakes for some reason, but a cakés a cake! this year i've become very festive...more so than the past few years. i decided to make my very first christmas wreath. i figured it should tie into my christmas tree somewhat so decided to make a felt/fabric wreath in the same colours as the tree. 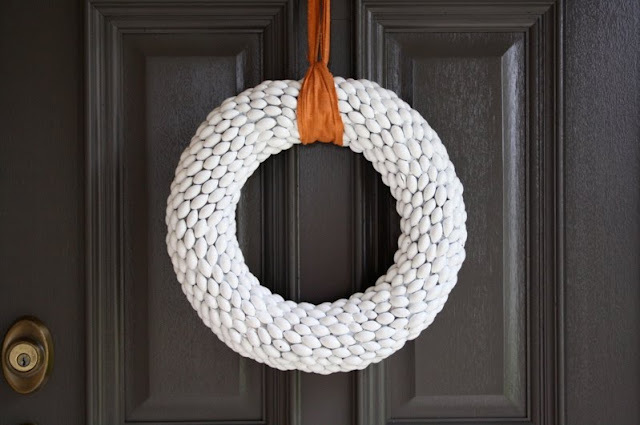 i purchased a foam wreath from spotlight the other day for a small fortune (i think $7 is alot for a plain old foam wreath...if i'd known the price before i go to the checkout i probably wouldnt still be doing this tutorial!!). you'll also need a range of felt/fabric in different patterns but similar colourings, a hot glue gun and some wool/ribbon/left over fabric. once i'd decided upon my design, i gathered my supplies: hot glue gun, foam/straw wreath and fabric in different patterns but complementary colours (i used lots of scraps for mine). oh and some wool /ribbon to hang it with. Now draw a line with the hot glue gun from the centre of the ring towards the outside. stick some fabric down. continue in this manner....making sure you glue towards the flat side each time. do this all the way around until you get back to the start. Now you will need to flip your wreath over and glue down the back of all the fabric. now depending on how precise you were before with measuring the lengths of the fabric, decides how much work you have to do now. i clearly wasn't too careful, but it doesn't take that long. all you do is glue down the fabric on the back. now if you're not like me (which is a bit slap happy), you could make sure all the ends meet up properly, or get a piece of ribbon or another bit of fabric and use that to cover up all the messiness at the back. me, i couldn't be bothered...i just wanted to get it up (and the chances that i'll want to rip it all off and reuse the wreath next year is highly likely, so less glue/fabric now, means less work later!). i also love this wreath above, but it called for acorns, which we don't have. i did think i could substitute almonds , but that would make for an expensive wreath. i gave up on the idea of this wreath then and went with the one i did. i should have kept looking further in the tutorial for the acorn wreath, as there is one made with kidney beans. oh well, that still would have meant a trip to the shops. have a go at this easy peasy wreath, made from bits and bobs at home. 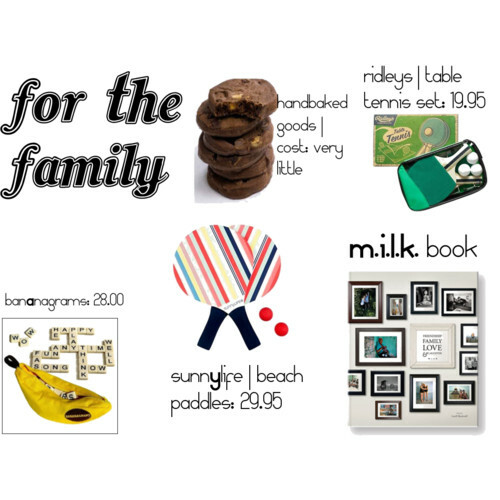 here are the final two installments of this years gift guide....first off we have for the family for those times when you get a family gift, not just an individual gift. first up....bake some cookies/mince pies/christmas cake......whatever takes your fancy. people love home-baked goodies. or if you're time poor, how about a table tennis set from ridleys (i've seen these in general pants co and david jones). a m.i.l.k book....beautiful coffee table book, beautiful photography from all around the world...available from good book stores (price unknown). i love these stripey beach paddles and this bananagrams game....scrabble on the go! and now don't lie when i ask the next question.....do you seriously not buy anything for yourself while you're out christmas shopping? i bet thats a no! 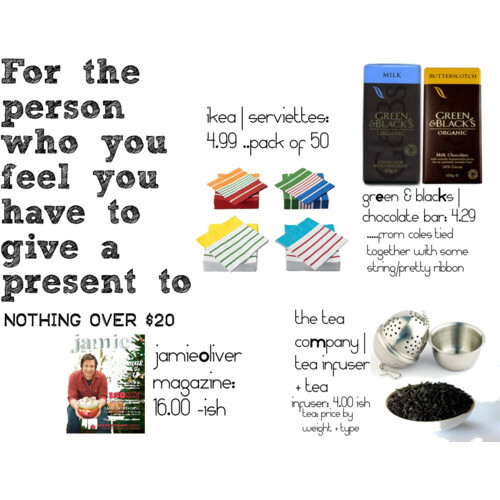 here are some things to treat yourself with for all the hard work and the effort you're putting into everyone else's christmas presents. what about some lovely looking body lotion from aesop? or the frankie mag's sweet treats book (this could also go in the family gifts guide) available from borders....for all your old-school fete type treats. i'm loving the 20 x 200 project making original artwork affordable for the rest of us and i'd adore a diana camera with the polaroid back! 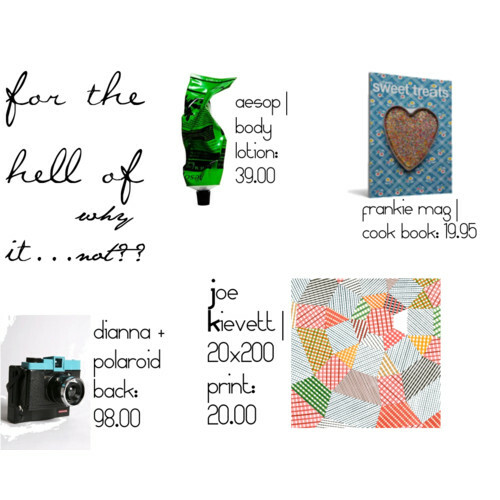 and that's it for the gift guide of 2010....i hope it has inspired some of your christmas ideas. i'm off to do a bit more christmas shopping today and finish off a lot of orders. how are you going with your christmas shopping?? this weeks theme was green with envy and it's been harder than i thought to do. if you want to join in, pop on over to danimezza and join in the fun. i don't wear much green, but i may seek out more after this set! i've got a fancy look with the green dress, more casual look with the black maxi and day look with the green cons. i'd pair all looks (excpet the fancy one) with a bowler hat and this set made me feel like i'd wear my glasses with relaxed laid back hair. all looks would be worn with a gold pendant necklace and wolf ring. serviettes from ikea....you could even splash out and give them the matching zip lock bags! but serviettes can be pretty when presented well. green and blacks chocolate. fancier than cadbury's (making it look like you made an effort...nudge nudge) but so much better for the world - fairtrade, organic, deelish! available from coles...also available in mini packs. tea infuser and loose leaf tea....simple yet lovely. the jamie oliver magazine for the lovers of food, available from borders and the most expensive thing here. so not totally mean and thoughtless...like candles or roses/favourites. you've made an effort and you haven't spent a fortune! so if yesterday was for the big girls, then today must be just for the big boys. i think this type are some of the hardest to buy for. i've had a crack...see what you think. a graphic t-shirt is usually a winner (unless you have my husband and you have to make sure the sleeves aren't too short or tight! )...mooks can be found at universal store. a nice "weekend hat"as my husband calls them, fancy pair of sunnies and something non-technological to make lazy summer afternoons pass. hope this gives you some ideas....if these fail, i say a magazine and a block of choccy....or wait for the next installment of gift guides, they may help you out a wee bit more. doing it for the bigger girls today......we are all big girls aren't we really?? tha kaftan can be bought in david jones...love that colour blue!! can you ever have enough canvas bags?? mt tape can be bought online at notemaker, but i recently found it in my local borders (was so effing excited!!!). i adore this deer ring by pigeonhole and the best body lotion in town......all 100% natural and environmentally friendly....my fave is the sweetcakes one! i'm so tempted to not wait for someone to buy me some of these things. i want them ALL!! here are some sweet treats for your little boys......love these dr seuss cons! 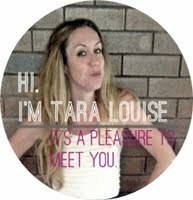 tops by tara louise designs that can be custom made to any size..., the nose book is amazing....(not sure where you can get it from in english, but had to include it. it's awesome. goes on about how your nose is not a pocket for your fingers, or peas or lego etc. 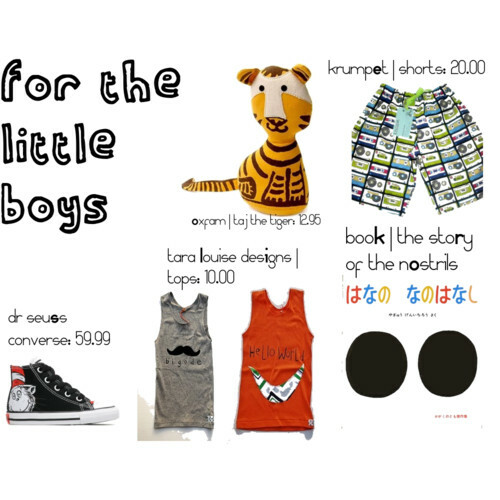 ), the cute tiger is from oxfam and the shorts are by krumpet. yesterday i finally finished making my christmas tree that i was harping on about in this post. and once it was done i couldnt help but decorate it then and there....one day early isn't too bad right? 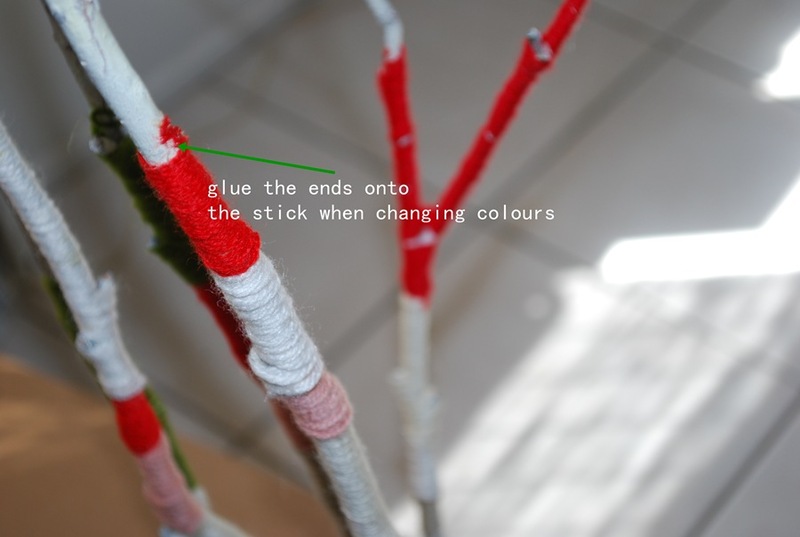 a hot glue gun, wool in various colours, sticks, 1 pot, spray paint (optional), sand/gravel/rocks. 1. grab some sticks...all different lengths, all different shapes. place together to see how they look. 2. grab an old pot you have lying around the house (remembering that the longer your sticks are the heavier and larger your pot has to be). i spray painted mine white.... i did this for last years tree. 3. Tie the sticks together at the bottom. i think i used wire then wrapped jute around to cover it. 4. pop the sticks into the pot. fill up the pot with sand/gravel or rocks. (keep in mind beach sand, while beautiful and white, doesn't hold the sticks up too well...and you'll need to close the hole at the bottom). 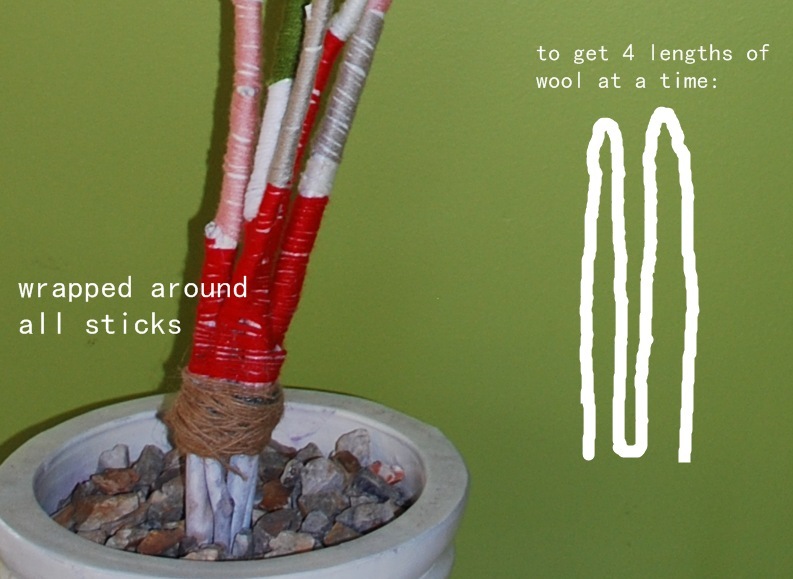 5. now, you can either spray paint your sticks before you start with the wool or not. it's up to you. depends on the look you are going for. my tree was already white from last year. 6. now the part that takes the longest.......this took me a few hours over a few days while i was catching up on tv shows. 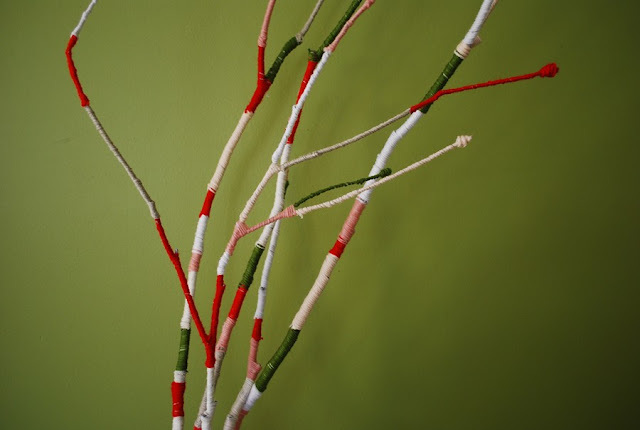 put some glue at the base of the tree and wrap the wool around the bottom of the sticks. i found it easier to use 4 lengths of wool at a time. it was way quicker! 7. wrap the wool around the sticks gluing every now and then...working out what looks best with your sticks and arrangement. when you're ready to change colours...just glue the ends down onto the stick. then go and go and go for gold! 8. with the smallest twigs, i wrapped extra bits of wool around the tip to create a little ball at the end...as below. 9. then all that's left to do is decorate! i actually think it would be awesome to do this just as an everyday decoration in different coloured wools.